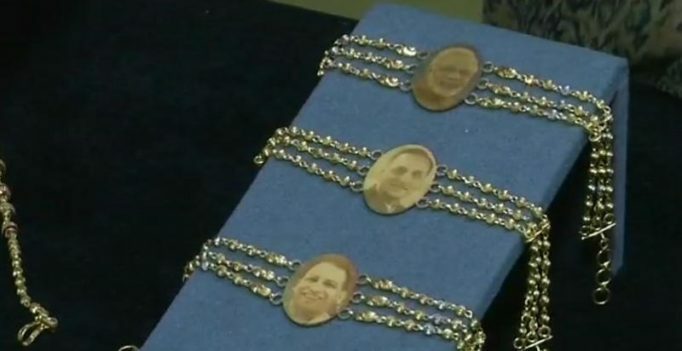 Surat: As the festival of Raksha bandhan nears, a jewellery shop in the diamond city of Surat in Gujarat is selling rakhis with pictures of Prime Minister Narendra Modi, Yogi Adityanath and Vijay Rupani encased in gold on them. The rakhis made of 22 carat gold, have been priced between Rs 30,000 to Rs 60,000. “By tying this Narendra Modi rakhi I would bless my brother to do something great like Prime Minister Narendra Modi,” said a customer. The jeweller said he had 50 such rakhis designed and made and as many as 47 of them have been sold out, and orders are still pouring in. “Our Prime Minister Narendra Modi, the Gujarat Chief Minister and the Uttar Pradesh Chief Minister have done very good work for our country and they inspire millions across the world,” said the jewellery shop owner Milan.